1. Prepare Grilled Steak, Onions & Tomatoes: Prepare outdoor grill for direct grilling over medium-high heat. Line large plate with aluminum foil; place onions and tomatoes on prepared plate. Lightly spray green onions and tomatoes with nonstick cooking spray. In small bowl, combine coffee, cumin, coriander, black pepper, cayenne pepper and salt. Rub coffee mixture over outside of steak. 2. Meanwhile, coat grill rack with vegetable oil. Place steak, onions and tomatoes, cut side down, on hot grill rack. Cook steak 8 to 9 minutes or until outside is browned, turning once halfway through cooking; cook onions and tomatoes 3 to 5 minutes or until lightly charred, turning once halfway through cooking. Transfer tomatoes to bowl; transfer onions to same plate. 3. Transfer foil with onions to hot grill rack; poke foil several times with fork. Turn burner under onions to medium; turn all other burners off. Cover and cook onions 20 minutes longer, turning onions once halfway through cooking; cook steak 20 to 24 minutes longer or until internal temperature reaches 135° for medium-rare, turning once halfway through cooking. Transfer steak and onions to same plate; let steak stand 5 minutes. 4. Meanwhile, in food processor with knife blade attached, pulse garlic, bread, bell pepper, almonds and tomatoes until coarsely chopped; scrape down side of bowl with rubber spatula. Add vinegar, oil, salt and pepper and purée 30 seconds or until well combined. Makes about 1-1/3 cups sauce. 5. Slice steak across the grain. 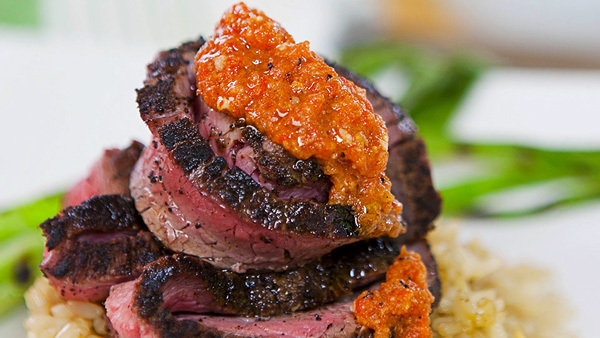 Serve steak over rice topped with Romesco sauce along with grilled onions. 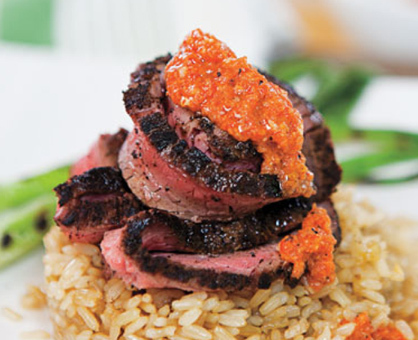 This recipe is low in sodium, and high in lycopene from antioxidant-rich tomatoes.